Ever since the invention of the clothes iron, the threat of burning clothes has weighed heavily on iron users. It doesn’t matter what kind of iron you used-from coal-heated irons to modern sleek ceramic soleplated irons, the threats of burning fabrics is still there. The good news is that you can finally free yourself from this historic threat by buying the Philips PerfectCare Pure GC761 steam iron. Not only do you get a powerful steam generating iron that can knock out even very deep creases on notoriously difficult fabrics, you can do so without the stress and worry that you might burn the fabric you’re working on. Sounds like quite a great deal, right? Well, it is but keep in mind that there is no such thing as a steam iron for all people and for all seasons. There is no such thing as a perfect product regardless of how many slick salespeople try to convince you otherwise. While the Philips PerfectCare Pure GC7619/20 Steam Iron definitely brings a lot to the table, it does have a drawback or two. Please frame the review below against the backdrop of your typical steam iron usage patterns as well as your specific ironing needs. This is the best way to analyze this project and come up with a truly informed purchasing decision. Unless you are sizing up a travel iron, whenever you are looking to buy an iron, especially a model with steam generating ability, the unit’s ability to produce steam must take front and center stage. You have to be very stringent in filtering out models that claim to be topnotch steam producers but don’t actually features needed to produce hot, heavy, and powerful steam. The good news about the Philips GC761 is that when it comes to generating steam, this unit is no slouch. In fact, it can produce a whopping five bars of steam pressure. This is enough to take out really tough creases. Also, its steam boost is a very impressive 200g of steam on top of its normal steam output of 120 grams per minute. This should be enough to handle even heavy fabrics. The secret to PerfectCare Pure steam production? This unit has a built in 1.5 litre water tank. Since the tank is segregated at the lower end of this steam iron’s assembly, you get the best of both worlds. First, you are sure to get a lot of water due to the 1.5 liter tank. This comes in really handy if you are going to be ironing large loads. Nothing breaks your momentum and ironing productivity than having to stop in the middle of ironing a large load because you have to refill your tank. Second, since the water tank and heating element are the iron are segregated, you are assured of a stronger blast of steam. Also, given the capacity of this model’s tank, you are assured of a longer blast of hot steam. While this Philips unit is not the first to feature an integrated steam and water tank design in a sleek form factor, the GC761 stands out from its competition because it has a smaller footprint. 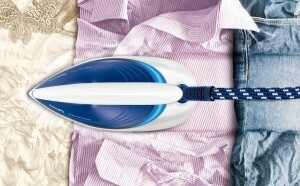 You don’t have to wield a bulky block around as you iron your clothes. The smaller form factor makes this model easier to use. You feel less tired and you are able to accomplish more. As mentioned above, this model isn’t perfect. As powerful as it is in terms of knocking out very pesky creases and wrinkles, all that steam power and heat come at a price-weight. This model weighs 3.2 kg. While you shouldn’t have much of a problem if you normally iron small loads, the weight of this model can be a source of frustration and irritation if you are going to be ironing tons of clothes. Its heavy weight can weigh down your arm as you go through a moderate to heavy load. You might to take some breaks in between loads. This might dramatically cut down your overall productivity. While this steam iron can definitely help you iron faster and knock out particularly irritating creases and wrinkles, its heavy weight can tire you out and make ironing your clothes a bigger chore than it already is. Say good-bye to fabric burns! Thanks to this unit’s OptimalTemp technology, you can finally say good-bye to fabric burns. One of the most common risks associated with irons is setting the temperature too high. While you can check the fabric many times and adjust your ironing pauses between passes to protect the fabric, this can be time-consuming and this can prove ineffective. There’s just too much guesswork involved. Not with OpitmalTemp technology! Thanks to Philips unit’s temperature control system, you only need to make one setting and you don’t have to worry about having to balance your iron’s ability to smooth out creases and burning your fabrics. 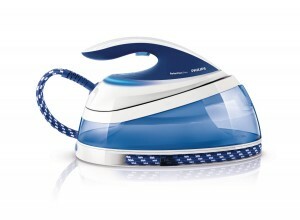 The PerfectCare Pure GC7619/20 Steam Iron does this balancing for you. Thanks to its small footprint, this model gives you wider latitude in terms of positioning your iron. This is no small detail. By allowing you to position the iron in a wide range of ways, you can direct the heat and steam more effectively. This can decrease your ironing time and produce the smooth fabric surfaces you’re looking for with less effort. Again, this all depends on your load. If your load is too big, the heavy weight of this iron might weigh you down and you might not be able to position it effectively. 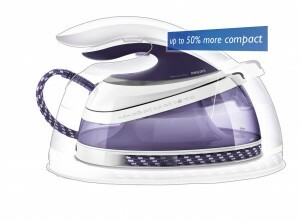 The Philips PerfectCare Pure GC7619/20 iron brings a lot to the table. 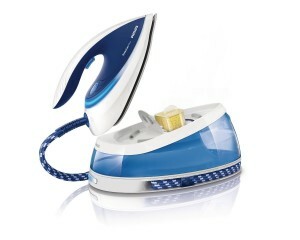 It eliminates one of the biggest perennial headaches of ironing-setting the right temperature and avoiding burns. It also delivers a lot of steam at the right temperature and pressure needed to smooth out even the most resistant creases. With all that said, you need to be mindful of the weight of this unit. If you are sure that you will only be handling fairly small or manageable intermediate loads, you should seriously consider this model.